Waterlogging is a major abiotic stress that limits the growth of plants. The crucial role of Ca2+ as a second messenger in response to abiotic and biotic stimuli has been widely recognized in plants. However, the physiological and molecular mechanisms of Ca2+ distribution within specific cell types in different root zones under hypoxia is poorly understood. In this work, whole-plant physiological and tissue-specific Ca2+ changes were studied using several ACA (Ca2+-ATPase) and CAX (Ca2+/proton exchanger) knock-out Arabidopsis mutants subjected to waterlogging treatment. 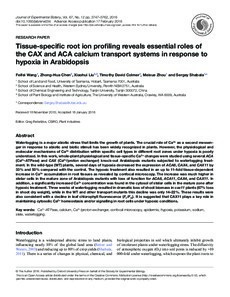 In the wild-type (WT) plants, several days of hypoxia decreased the expression of ACA8, CAX4, and CAX11 by 33% and 50% compared with the control. The hypoxic treatment also resulted in an up to 11-fold tissue-dependent increase in Ca2+ accumulation in root tissues as revealed by confocal microscopy. The increase was much higher in stelar cells in the mature zone of Arabidopsis mutants with loss of function for ACA8, ACA11, CAX4, and CAX11. In addition, a significantly increased Ca2+ concentration was found in the cytosol of stelar cells in the mature zone after hypoxic treatment. Three weeks of waterlogging resulted in dramatic loss of shoot biomass in cax11 plants (67% loss in shoot dry weight), while in the WT and other transport mutants this decline was only 14–22%. These results were also consistent with a decline in leaf chlorophyll fluorescence (Fv/Fm). It is suggested that CAX11 plays a key role in maintaining cytosolic Ca2+ homeostasis and/or signalling in root cells under hypoxic conditions.